IMAN’s Board of Directors voted in its newest member, Katie Marciniak, during the January meeting. 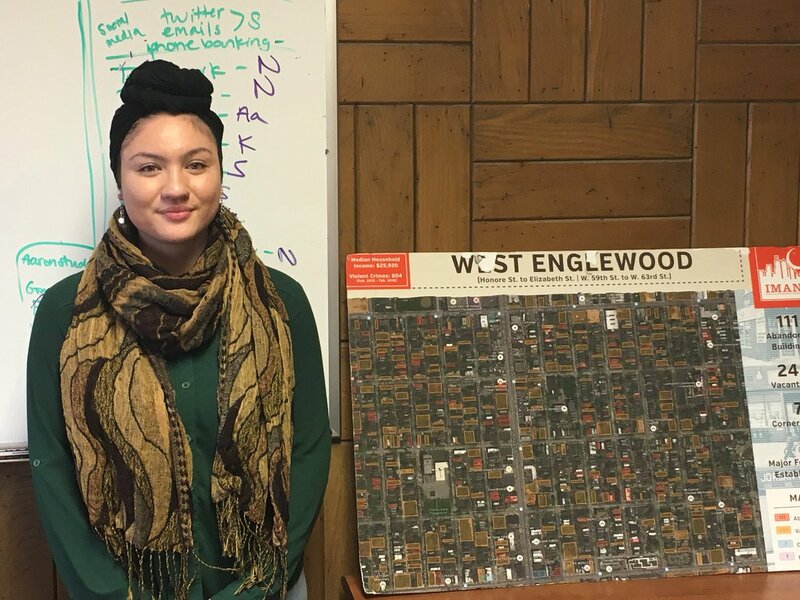 Katie, a local community member and recent graduate of Gage Park High School, is no stranger to IMAN and has emerged as a dynamic youth leader and organizer during her several years with the organization. Currently, she serves at IMAN as an Outreach and Wellness Coordinator through the Public Allies program, working with three South Side high schools to engage students around food access and its systematic connections to other issues impacting marginalized communities. Katie recently shared how her relationship with IMAN has fostered her personal growth and helped to define her purpose. Q: How did you become involved with IMAN? A: I originally became involved through the farmers market, through an organization that partnered with my high school. At that time Shamar introduced himself as a youth director at IMAN and I then started to engage more. I continued to look for opportunities to further my community work because I knew I was passionate about being deeply involved in my community, but I didn’t really know what opportunities to explore. I believe it was back in 2015 when I first became involved with the youth council, where we had discussions about community issues and how they impacted us. After the youth council, I stayed regularly engaged at IMAN, and then my next opportunity was being part of the MLK Memorial. I was essentially a student representative on the planning committee, and that gave me an opportunity to further the efforts of the people who previously worked to create a project to commemorate King and to continue the efforts of the students from my high school who were there before me. This was my first real opportunity to become deeply involved in a project with IMAN, which gave me the chance to really see a vision come to life. Q: Did you ever aspire to become a board member at IMAN? A: Well when the opportunity was presented to me, I thought it was really beneficial as soon as I heard about it. I was interested in bringing my perspective to the board and to be able to enhance the organization as a whole…internally, considering I do have a position currently in the organization, and externally as well to ensure that the services that are being offered meet the community’s needs considering I am from the area and still residing in the community. Q: What does your new role as an IMAN board member mean to you? A: It means being able to contribute and being a new voice for the betterment of the organization and the community, especially for the youth. To be that model and to have a direct say in things that go on in our community, and to show that they have the capability to be in a position where their voices can be heard and impact decision making processes on behalf of their community. Q: How has being involved in the work at IMAN shaped your life? A: Wow, how hasn’t it shaped my life?! I feel like IMAN has really given me opportunities to better understand myself and the community, mentally and spiritually. And over time I feel like I’ve been constantly progressing through those opportunities especially through leadership as I’ve gained more leadership within the organization. And just being able to use the skills and knowledge that I’ve acquired here, beyond the organization and beyond my community… or just really being able to use my skills in any space. I definitely feel from this point on I will go on to continue to create an impact, large and small, due to everything I’ve learned and gained through my experiences and the people I’ve met. Q: What is your advice to other young people about getting involved? A: You don’t have to have a deep educational background or experience to get involved in your community. I believe all young people have a voice, it’s just a matter of exploring those different opportunities, specifically community related opportunities that help you find your voice and find your passion. Don’t be afraid to expose yourself to different people in your community and put yourself in those spaces that help you better understand community issues as a whole and are interconnected. Utilize the knowledge that you have received and take steps to then find your purpose. This entry was posted in News, Organizing & Advocacy, Youth Services by IMAN Staff. Bookmark the permalink.